It seems strange, but singing the same Christmas carols year after year is delightful. "O Little Town of Bethlehem" is one of them. It never ceases to be meaningful as I picture the many visual images in the words. I accept its beauty with joy in my heart and the simple beat of its music. However, there was a day when I sang the carol and tears flowed. I dabbed my cheeks with a tissue, as I sang with new enthusiasm and greater joy. Something had changed. It was the first time I had ever sung this endearing hymn in a very special place - the REAL little town of Bethlehem. My husband and I sat with friends who had traveled together from our home church in Tennessee. It was evident that everyone was deeply touched by the Spirit of God. We sat in the Church of the Nativity that is built over the spot where it is believed that Jesus was born. Hearing about Bethlehem was not the same as being a part of it. Reading about the birth of Jesus was not the same as worshiping in Bethlehem. Who Wrote the Christmas Carol "O Little Town of Bethlehem?" The minister of Holy Trinity, Phillips Brooks, was born in Boston, in 1825 and educated at Harvard. He was a beloved and respected evangelist. After serving several Episcopal churches in Philadelphia and Boston, he was appointed Bishop of that area. This giant of a man, who stood 6-feet 8 inches, also had a big heart that endeared him to old and young alike. There were toys in his office for the many children who visited him. It was a familiar sight to see the beloved bishop sitting on the floor playing a game with a group of children. He never married but other people's children became like a family to him When he died unexpectedly in 1893, at the age of 58, everyone was overwhelmed with grief. It was a child who put his death in a beautiful light. When told by her mother that Bishop Brooks had gone to heaven, she simply said, "Oh Mama, how happy the angels will be." The Story and Meaning Behind "O Little Town of Bethlehem"
Phillips Brooks, the composer of this famous Christmas carol, was the minister of Holy Trinity Church in Philadelphia and had visited Bethlehem in December of 1865. Phillips Brooks traveled to the Holy Land. The itinerary included a horseback ride from Jerusalem to Bethlehem on Christmas Eve. Back then it truly was a small village, far removed from the bustling city it would later become. By nightfall he was in the field where, according to tradition, the shepherds heard the angelic announcement. Then he attended the Christmas Eve service at the Church of the Nativity in Bethlehem. Something about the beauty and simplicity of that visit stayed with Phillips Brooks when he returned to America. Several years later, when he wanted a new song of Christmas for the children to sing at his church, he reached back in memory for inspiration from his Holy Land visit. The poem he wrote painted in words the sights and sounds of that little town of Bethlehem he had visited. The silent stars go by..."
Then he asked the church organist, Lewis Redner, to compose a simple melody for the children to sing on Christmas Eve. Mr.Redner sat down at the piano to find just the right tune to carry the descriptive words. But nothing he wrote seemed to fit. On the night before the Christmas Eve service he felt defeated, so he went to bed. During his fretful sleep it seemed that he heard music. Immediately, he got up and wrote down the melody just as we sing it today. When he joyfully presented it to Rev. Brooks he said: "I think it was a gift from heaven." The children sounded like a choir of angels as they sang the new carol written just for them. 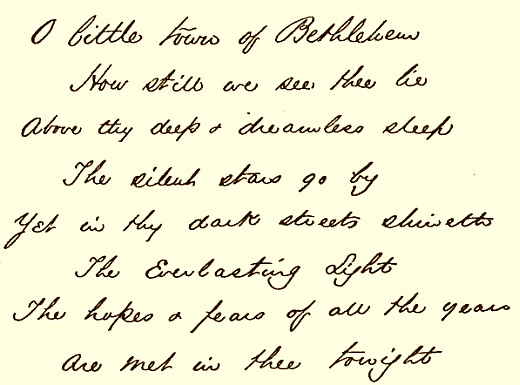 “O Little of Bethlehem” quickly became a favorite after it was published in 1874. We are blessed to continue singing it over one hundred years later. 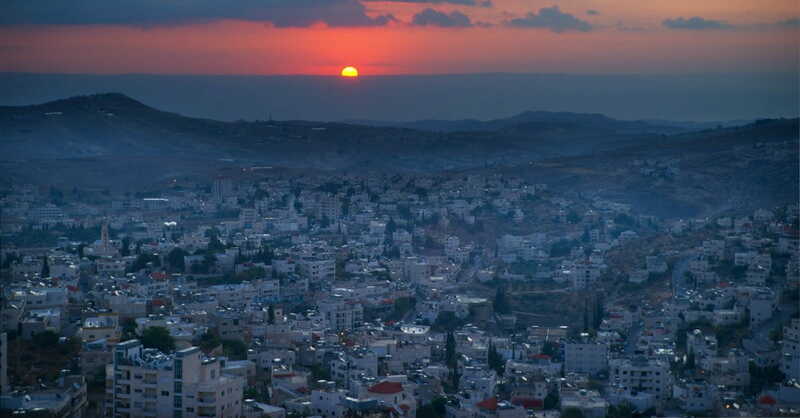 Within the beauty of "O Little Town of Bethlehem" is one of God's promises from the prophet Micah: "Bethlehem Ephrathah, you are one of the little towns of Judah, but from you I will bring a ruler for Israel, whose family line goes back to ancient times." (Micah 5:2, GNB). Decend to us, we pray. I thank you, O God, for sending your beloved son, Jesus, to be born in Bethlehem, just as you foretold. I also thank you that my heart, too, has become His birthplace. I pray in Jesus name, Amen.